Worcester full-back Chris Pennell has been tipped to claim end-of-season honours by Warriors director of rugby Dean Ryan. 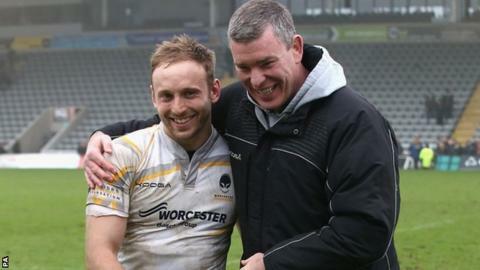 Despite bottom club Worcester's season-long battle against relegation, Pennell is on the six-man Premiership Player of the Year shortlist. And Ryan, who first suggested Pennell, 27, for an England call-up six months ago, is still backing his player. "It would be pretty foolish to ignore him," he told BBC Hereford & Worcester. Worcester Warriors academy graduate, whose primary role is at full-back. England Under-19 international, made his debut in the 2007-08 campaign, going on to make 12 top-flight appearances that season. Struck down by a bad knee injury the following season in a European game, but returned to full fitness in 2009-10. Just a few weeks after being named club captain in 2010, he was then hit by an ankle injury that ruled him out of the first half of the Championship promotion-winning campaign. After signing a new contract in January 2013, made his 100th appearance for the club in April, scoring his 20th try. "His nomination for the award is well deserved. And I hope it goes on to be something more than that. "There are a number of challenges at the end of the season which the England selectors are going to have to look at. "And I'd be gobsmacked if he's not at least in the conversation round the selectors' table. "He's getting real attention now and deservedly so. He's a quality player. "Being here makes it harder to illustrate that. There's a perception that there aren't international players. It's doubly difficult to illustrate that you're a potential Test player. "And I don't think anyone in the game would question that he's been one of the form Premiership players." Pennell, whose team will be relegated if they do not win at leaders Saracens on Saturday, has been nominated for the Premiership Player of the Season award alongside Sale flanker Dan Braid, Harlequins full-back Mike Brown, Saracens flanker Jacques Burger, Leicester centre Niki Goneva and Northampton forward Samu Manoa. With two rounds of fixtures to go, Pennell leads the league in terms of most carries (253), and is well clear in metres made (1527), almost 200 more than the man in second, Gloucester's Rob Cook. Only his Worcester team-mate Josh Drauniniu (55) is ahead of him in beating defenders, Pennell currently standing one shy on 54.